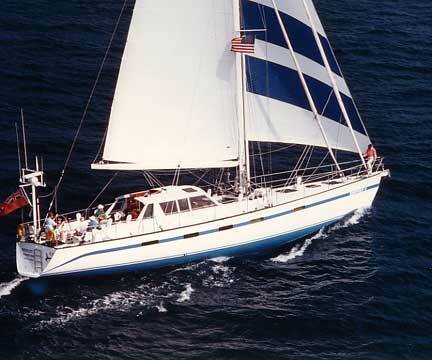 As the profile drew closer it turned into a rig we knew well, the Sundeer 64 cutter. 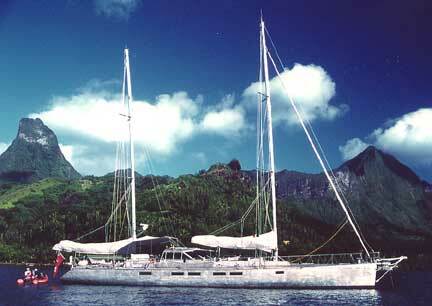 This was the yacht we’d earlier noticed moored in Smith Cove, a sistership to Raven. Greetings, SetSailors! 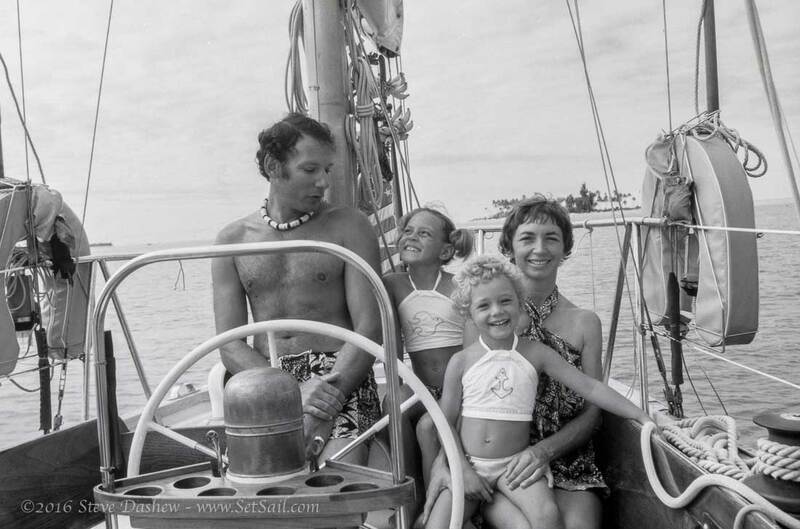 Sarah Dashew here, Steve & Linda’s younger daughter and a fairly new member of the SetSail crew. 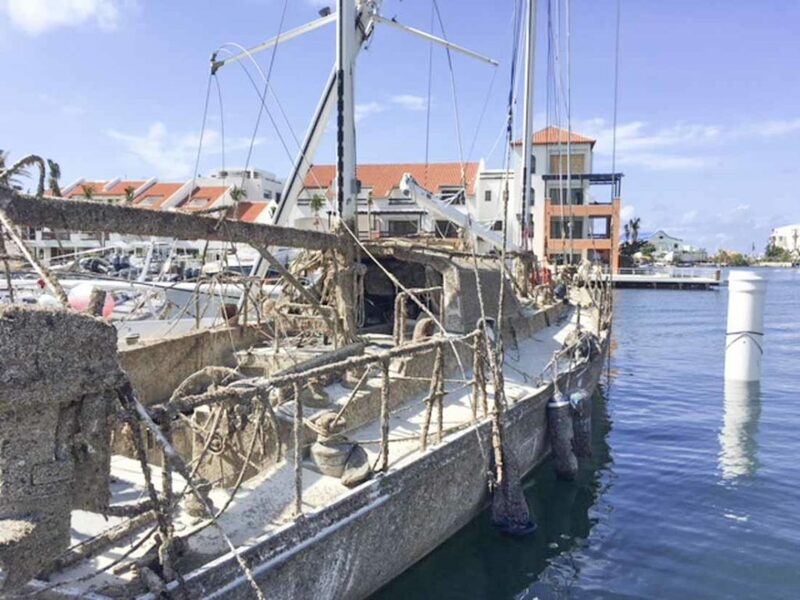 For the past several months, I’ve been rummaging through our sail inventory, so to speak: cleaning, updating, organizing, and generally digging around. 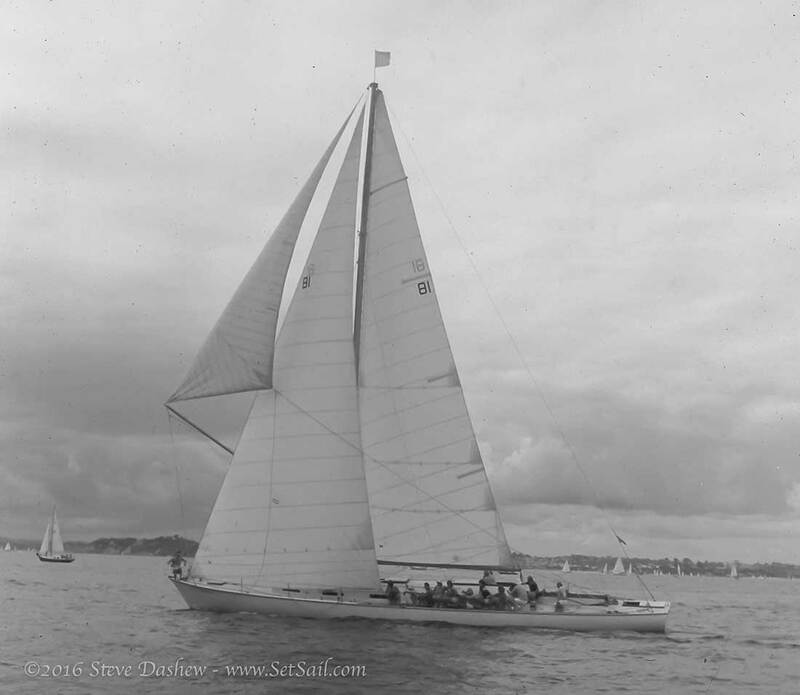 One of the most interesting projects on my plate at the moment is compiling an owner history of our Sundeer and Deerfoot yachts. 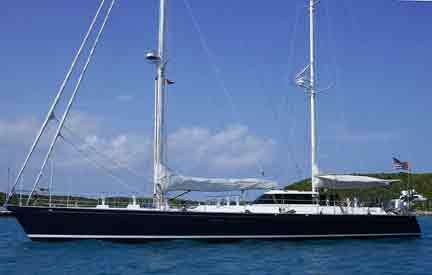 We thought it was time, after 30 years of designing and building yachts for like-minded cruising sailors, to finally start putting together a record of where these vessels have voyaged. 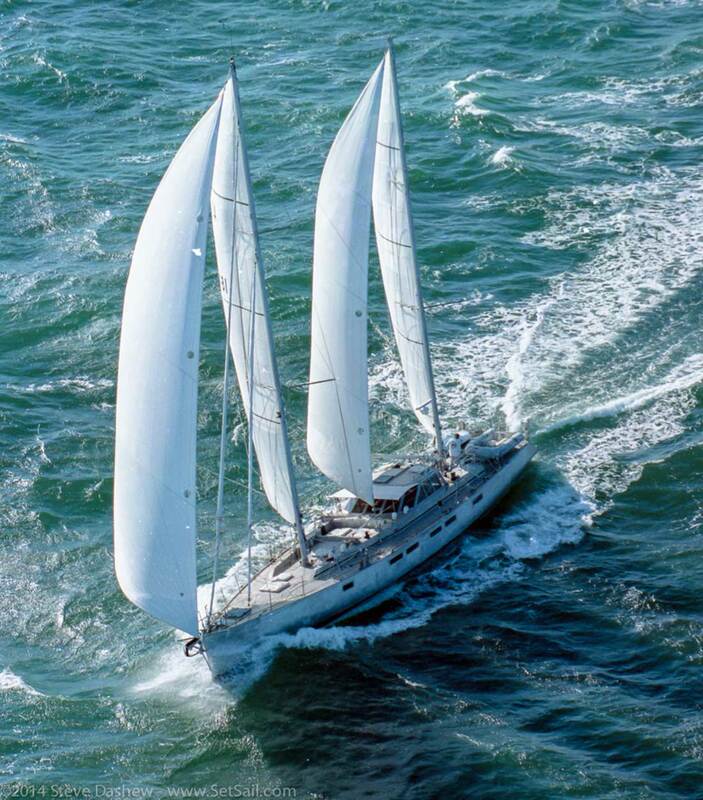 We’ve been in touch so far with 32 of the current owners, and their yachts have an average of 55,734 nautical miles under their respective keels. 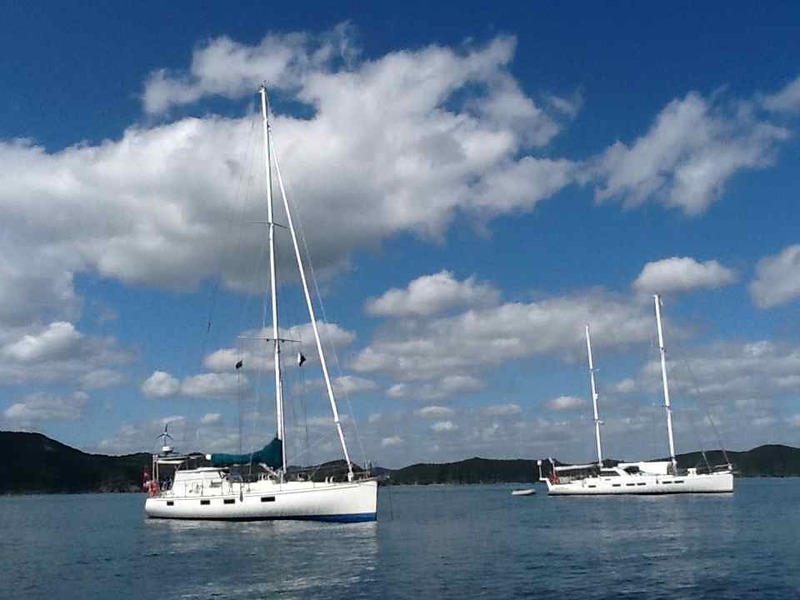 Shown above is the Deerfoot 73 Wakaroa, the Sundeer 64 Raven, and the FPB 83 prototype, Wind Horse, anchored together at Malololailai, Fiji. 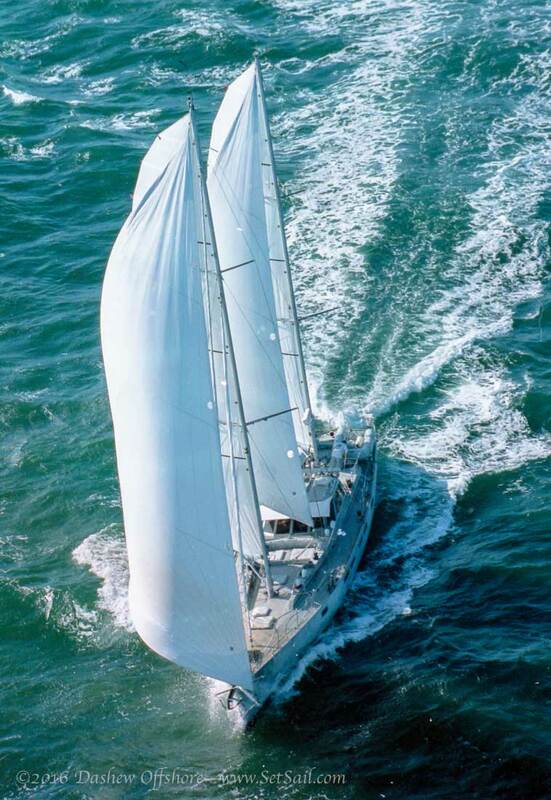 If you are or have been one of our owners, or have voyaged on one of these yachts, please contact me at Sarah@SetSail.com, and fill us in on your history. 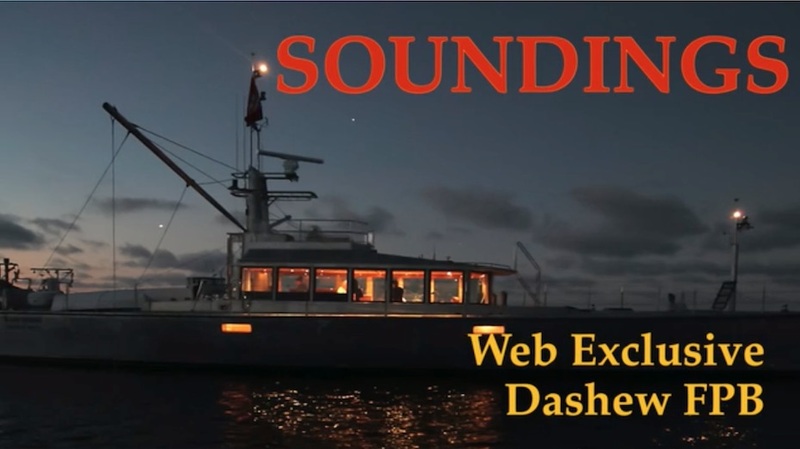 Let us know if you have a dedicated web site. 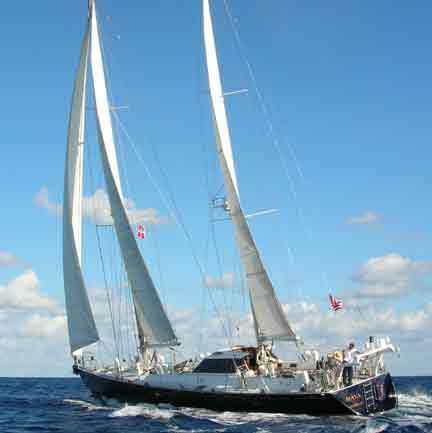 We’d also love to have photos of these yachts, both for our own viewing pleasure and that of the extended SetSail family. For current owners, we have recently created an owner forum. Click here for info on how to sign up. 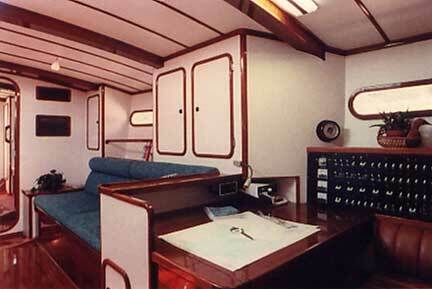 The layout for the Sundeer 64 series followed closely on what had worked so well with our own Sundeer 67. 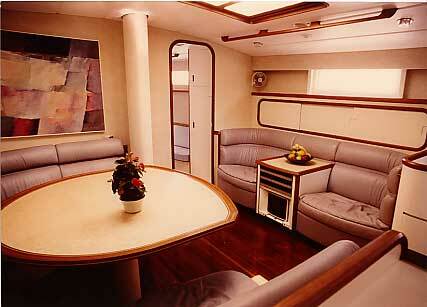 The aft engine room made one large saloon/galley/office area possible. 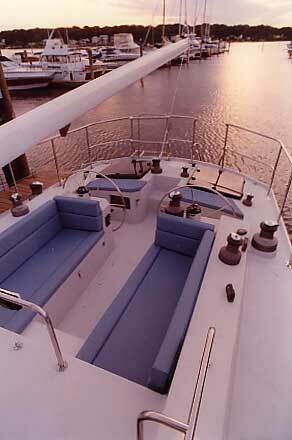 The Sundeer 65 and the 56/60 were the only production boats we’ve done. We worked hard with TPI, who built them under our direct supervision, to upgrade their normal standards. Everyone was pleasantly surprised by the results, which the photos do not do justice. 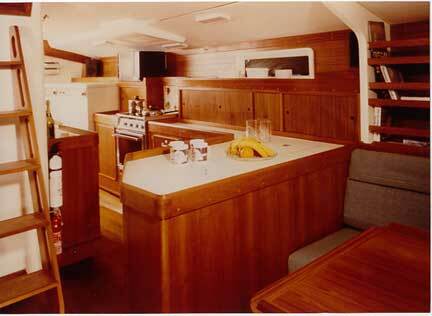 with fridge/freezer under the pilot house, and bin lockers on top of the counters, was identical to our Sundeer 67. 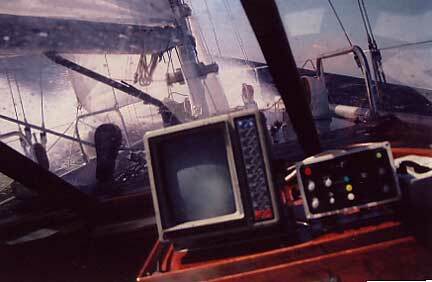 Office is to starboard, opposite the galley. 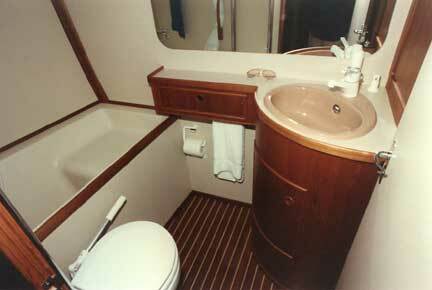 and vanity (this photo is looking aft). 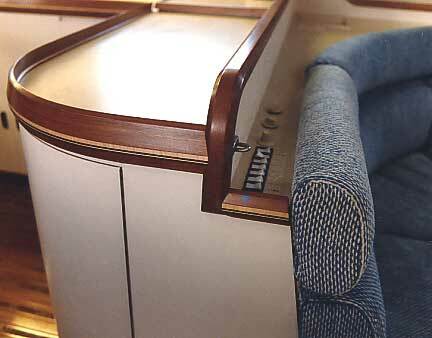 This bulkhead bolster is an interesting detail. 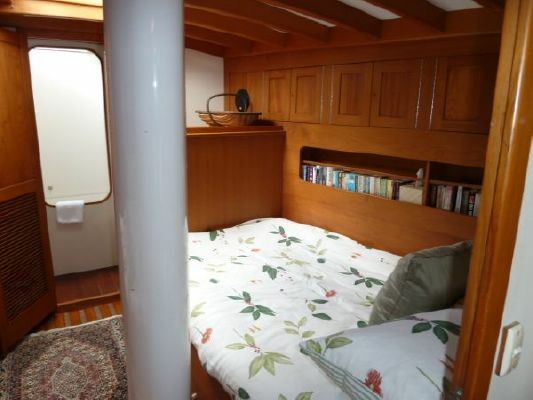 It looks good, and softens the bulkhead when you’re sitting up at night reading. 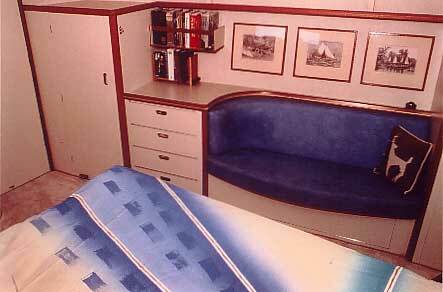 Guest cabins are aft. 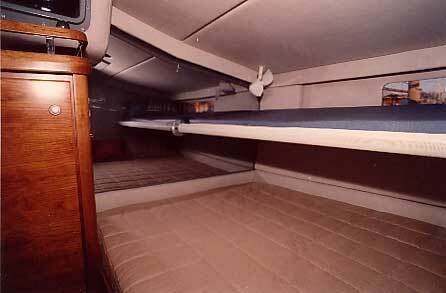 A double on one side and upper/lower bunks on the other. 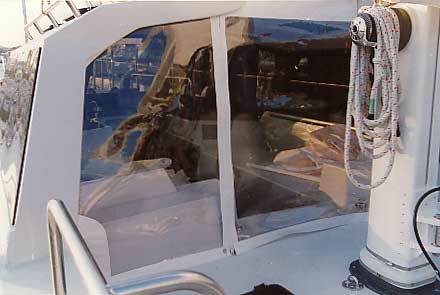 Note the mirrored bulkhead. 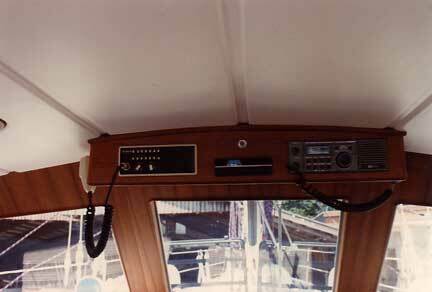 Some of the boats had removable pipe berths installed. This view is looking aft. The hanging locker is on the left side of the photo. 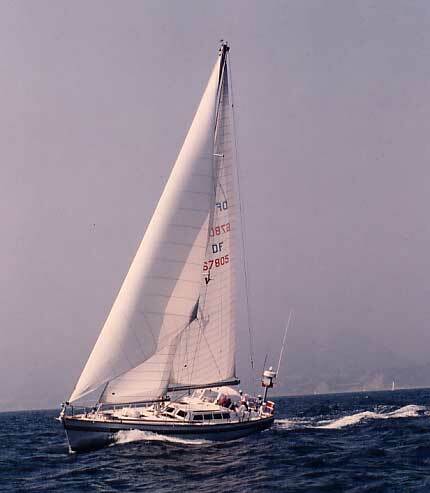 After our experience with the pilot house on the 67, we didn’t think anyone should go to sea without such a device, if the boat was big enough to handle it. The back end has removable curtains to keep out wind and rain. 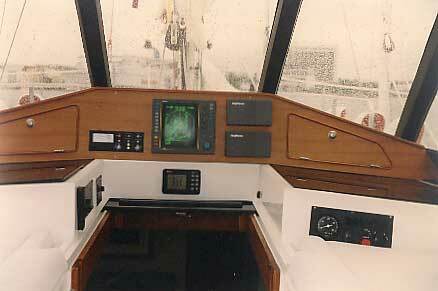 Our preference was to keep the interior simple, and trunion mount the electronics. 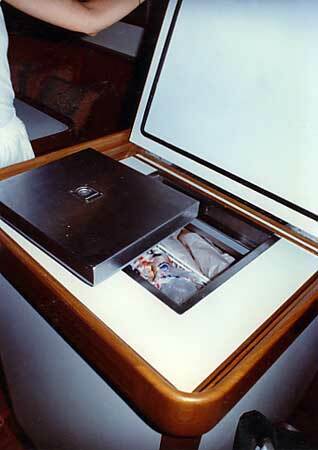 However, many of our clients ended up with custom enclosures like what is shown above. 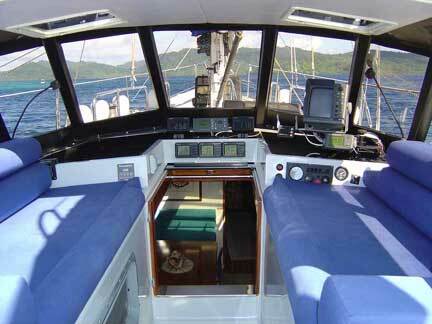 The lounging and sailing cockpit are aft of the pilot house. 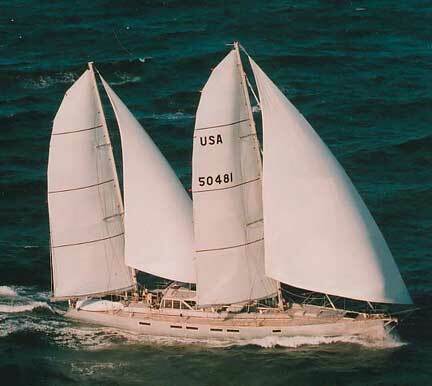 Twin wheels, and winches laid out so the helmsperson can trim sails, make the Sundeer 64 easy to cruise shorthanded. 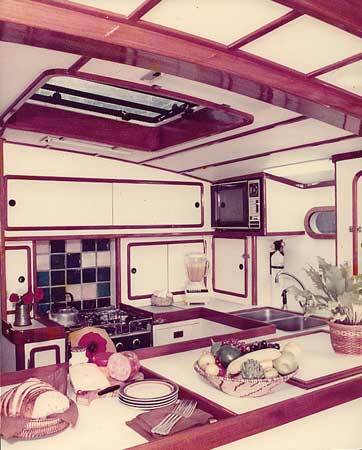 The first Sundeer 67 took a different approach to the interior layout. Whereas the preceding three Deerfoot pilot house 72s (and 74) had mid-ship engine room, with Sundeer we went back to an aft engine space. This made a great deal of space in the middle of the boat available. 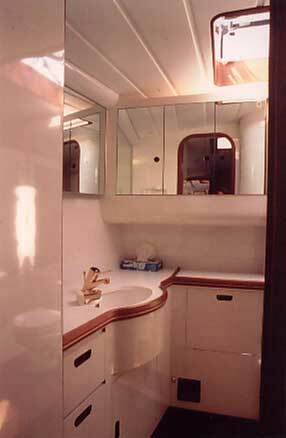 In effect, we had a similar length of saloon/galley/office area to the previous boats, but without the large chunk of engine room deducted. The handrail on the saloon table is removable. We leave it on at sea, and remove it in port. Looking aft you can see all the way to the aft bulkhead, with only the protrusion of the pilot house foot well blocking the view. 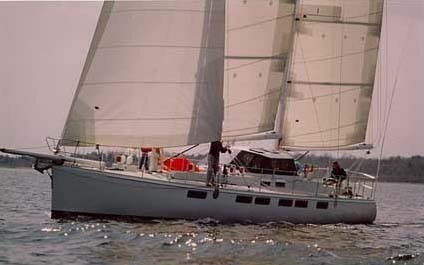 Even though Sundeer was significantly shorter and lighter than the preceding designs, she had more visual interior space. 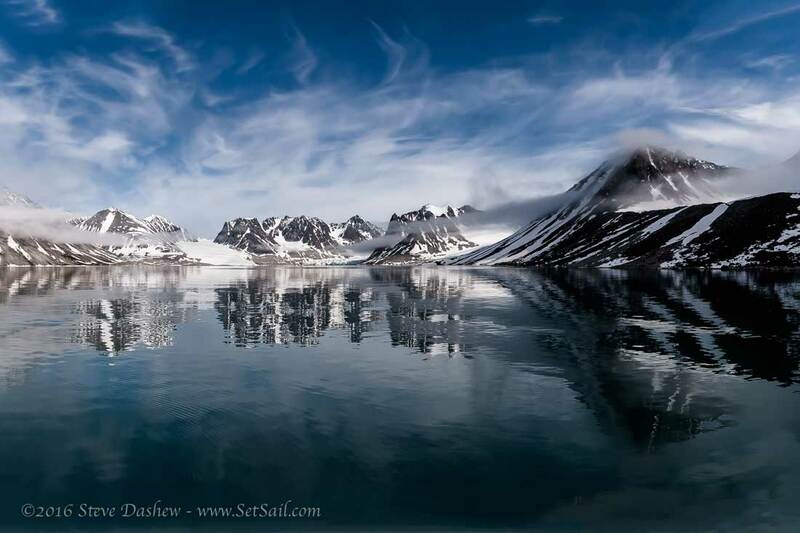 The starboard side (left of photo) was our office area. Room for lots of drawings, notebooks, and our computer. We can’t seem to be able to find our galley photos. However, this is the aft end. 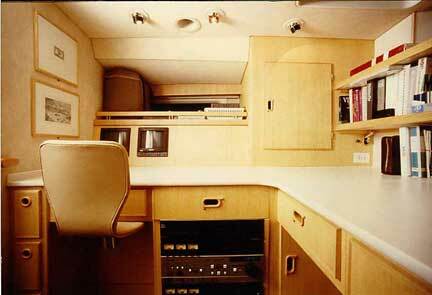 The large locker is what we call the pantry – we always try to fit something like this on every boat for general galley storage. Note how this locker is held down from the deck. 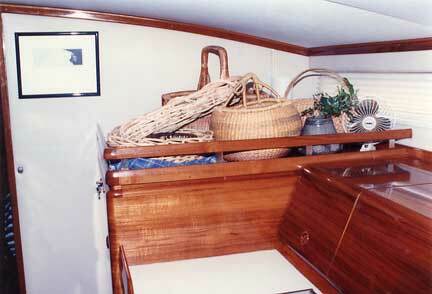 This reduces interior volume, but opens the space visually, and makes for a nice basket storage area. 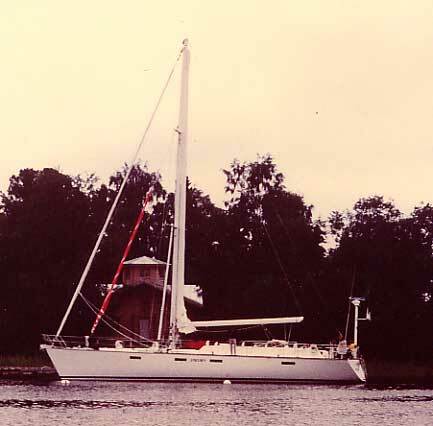 Sundeer was the first boat on which we lived with a pilot house – and it spoiled us. Aside from being dry and comfortable, the pilot house is a great spot from which to take photos when you are charging along. 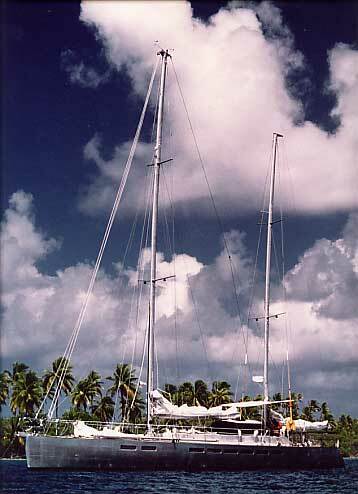 This was taken enroute to Papeete, Tahiti from New Zealand one lovely late summer day. 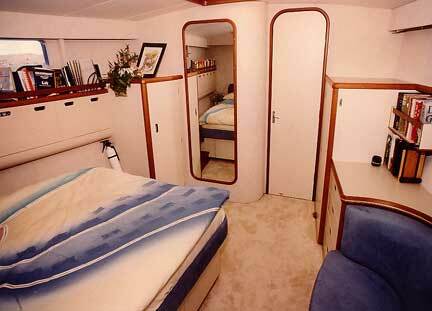 Both of the guest cabins had these hull lockers. They were as much an aesthetic treatment as for storage. 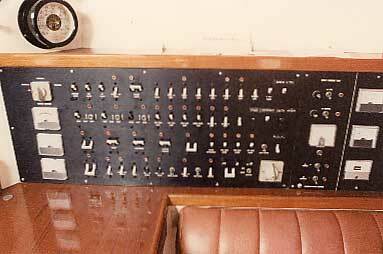 The location outboard and narrow interior made them expensive for the volume they produced. But they look nice. 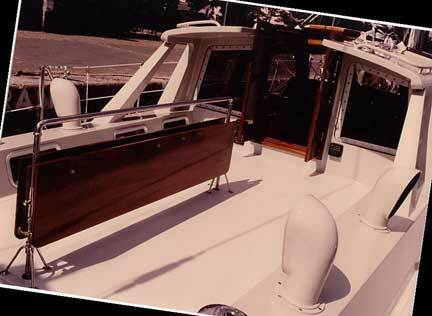 Sundeer was the first of our boats where we adapted normal door locking hardware to hold the floorboards in place. 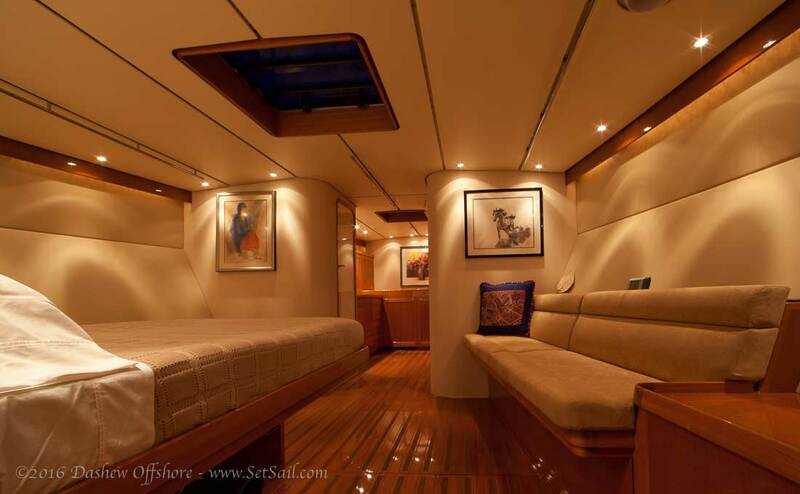 There is a huge difference in interior volume between a 62-foot and 58-foot yacht. 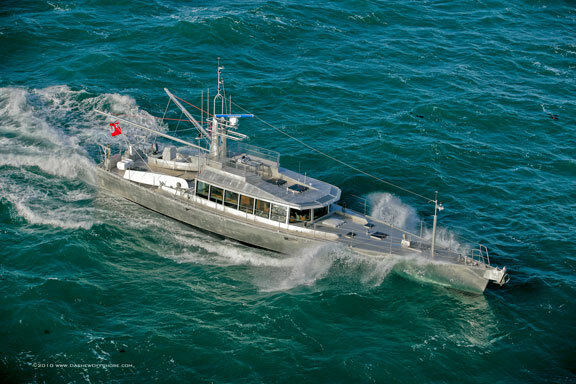 We’ve found smaller yachts much harder to design than larger projects. 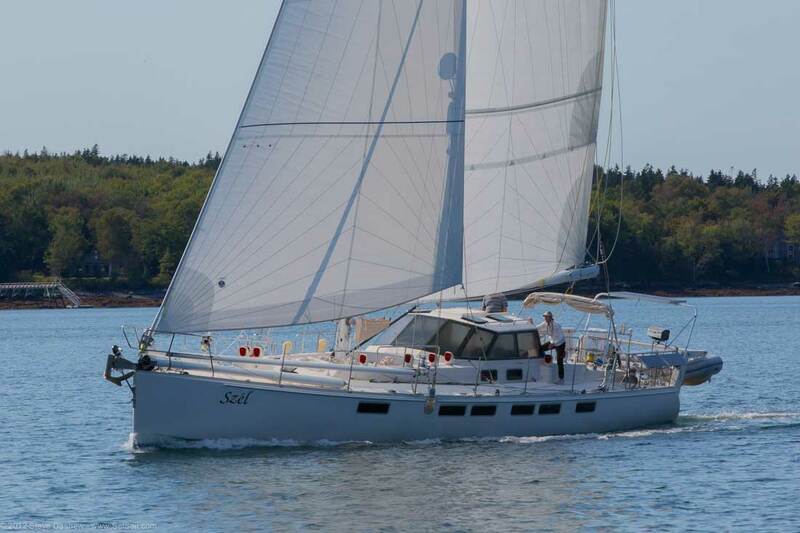 The Deerfoot 58 was probably our toughest project to this point. 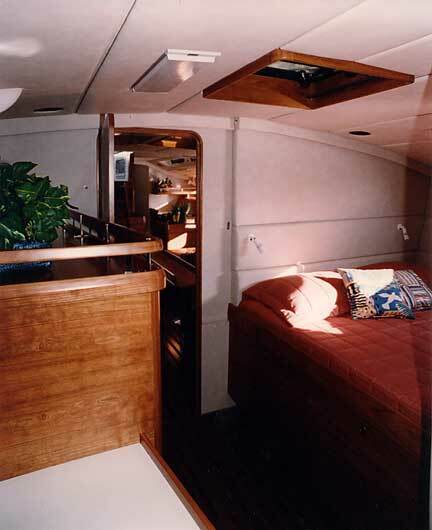 After examining a variety of different approaches, we came back to the same aft engine room, saloon/galley great room design that had worked so well in our previous yachts. 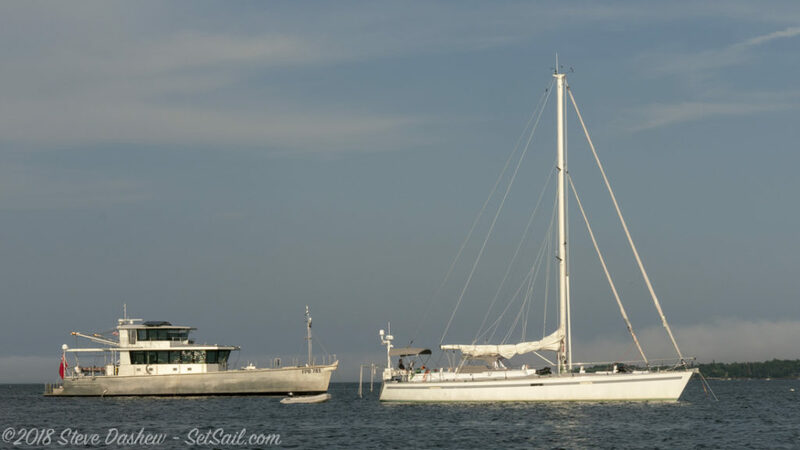 When we first looked at this boat in the water we’d come from sea trials on one of our 72-footers, and Terra Nova looked tiny. But when we walked below we were very pleasantly surprised at how well the space worked. 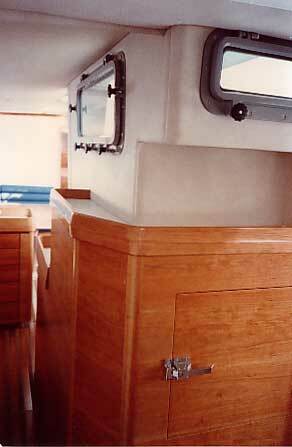 One of the tradeoffs in any design is hullside and bulkhead material. On one hand you have the warmth of wood. 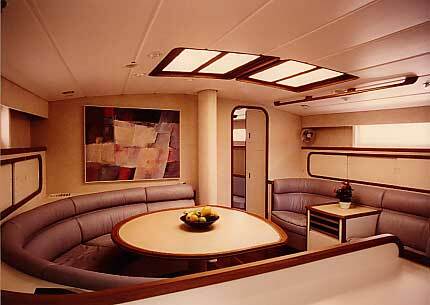 On the other, light-colored surfaces open the space visually. In the end, it’s a choice which has to be made by the client. 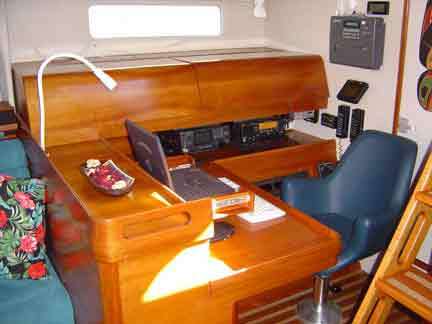 The office includes the usual electronics, a printer (large by today’s standards), and plenty of desk space for charts and paperwork. 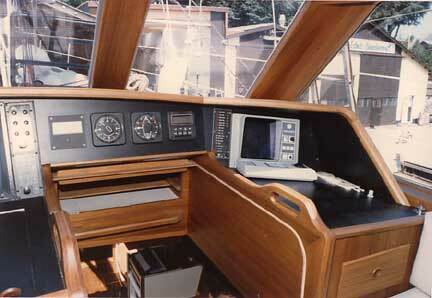 This is the first yacht on which we built in a computer. 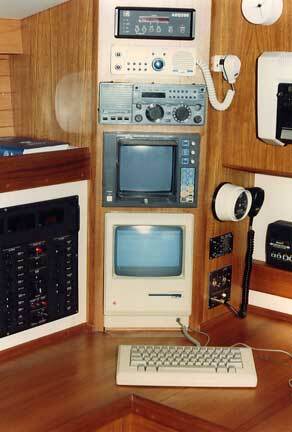 Those of you who are into ancient history will no doubt recognize an early Mac at the bottom of this stack. The Owner’s suite and head are forward. 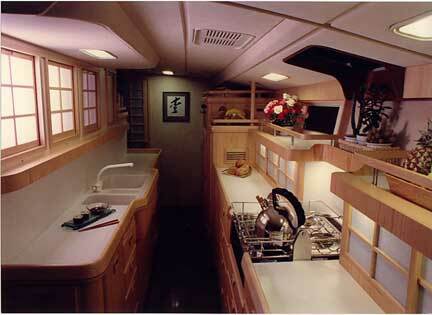 Hanging locker and storage units with vanity top are to starboard. We resisted the urge to bring the forward section of lockers higher for better volume. This would have significantly reduced the visual space in the stateroom. It is always tough to get a good head photo. This is about as close as we can get with a wide angle lens. Note the seat molded into the tub. We always try to have a place to sit down in at least one shower. 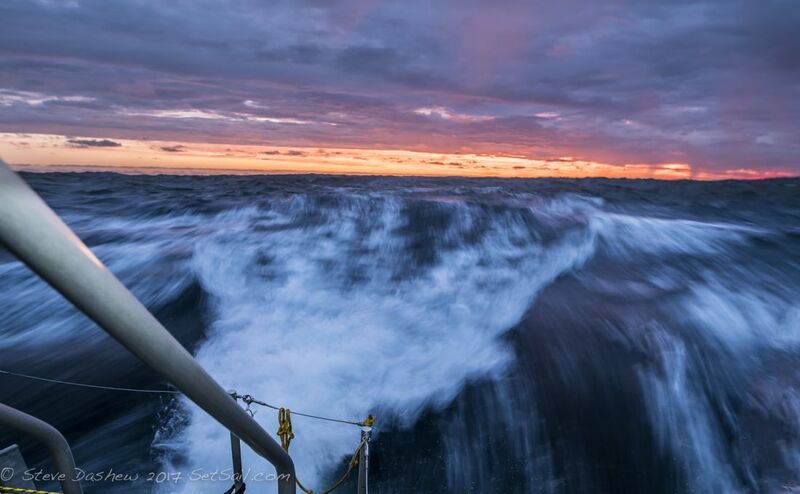 It makes it much easier to take a shower at sea. 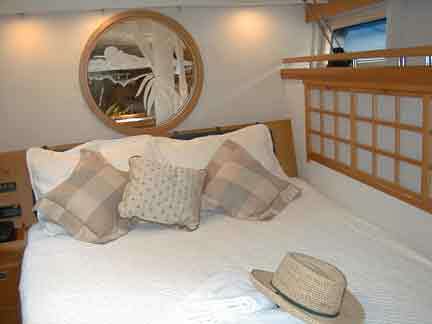 Guest staterooms are aft. Note the height of the hanging locker. 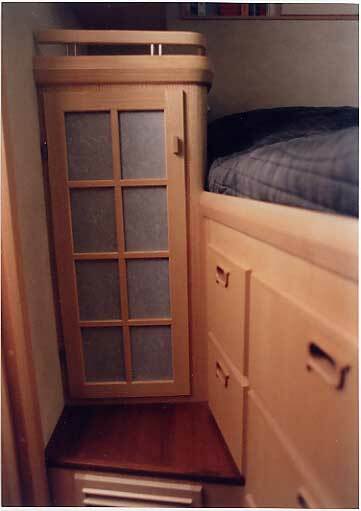 This maximizes storage, and leaves a small space on top to help create an open feeling. The amount of space above the top is a close call. We would have probably been better off leaving another four inches (100mm). The Deerfoot 74 Maya was unique in her styling. The asian theme is lovely to look at in the daytime, and is especially cool in the evening with all of the indirect lighting. 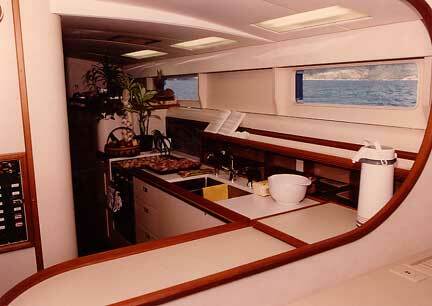 Maya’s galley runs down the hull side. 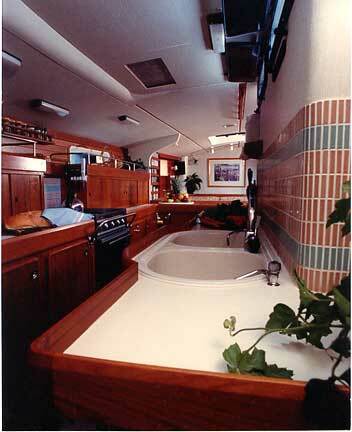 Counters on both sides of the passageway provide lots of working space, together with ample easily accessed storage. 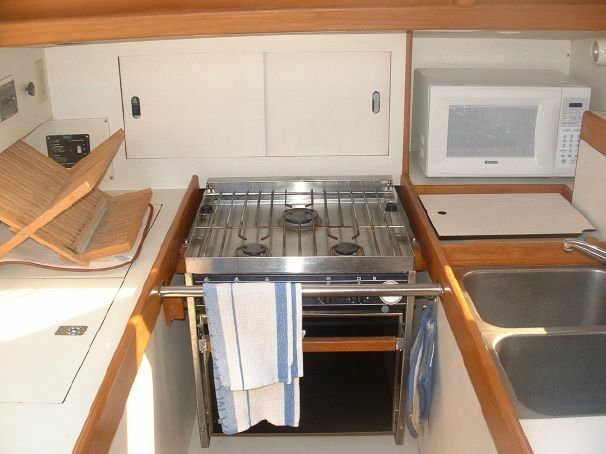 Fridge and freezer are at the end of the galley. Here is the same view, with the working lighting turned on. 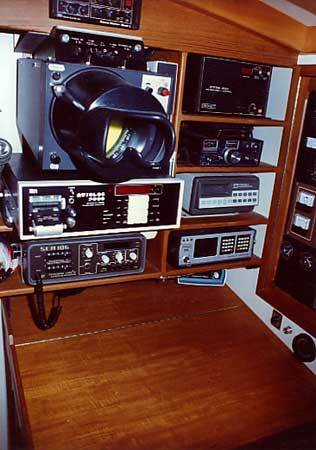 Ship’s office with dual pole breaker system in the deck head (nav gear is in the pilot house). Owner’s suite forward. 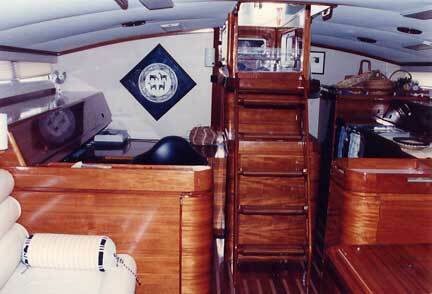 Note the etched glass sculpture between saloon and the head of the bunk. There was a ring of lighting around this sculpture – very spectacular at night. The appearance during the day isn’t too bad either. 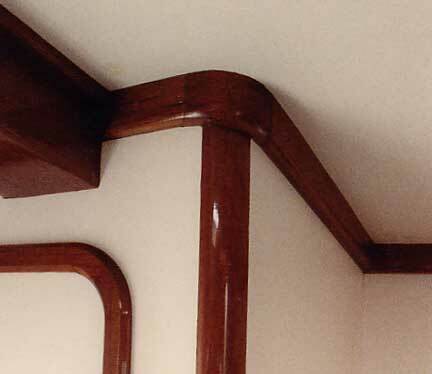 Guest cabin joinerwork details. 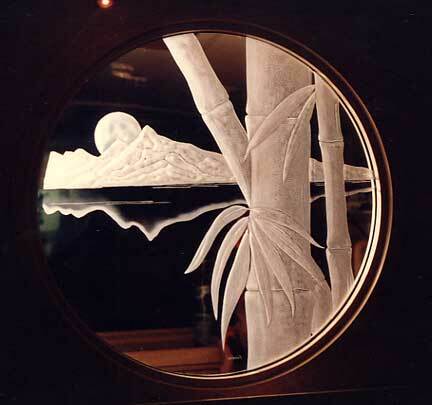 A form of fiberglass was used to create the appearance of Japanese shoji screens. 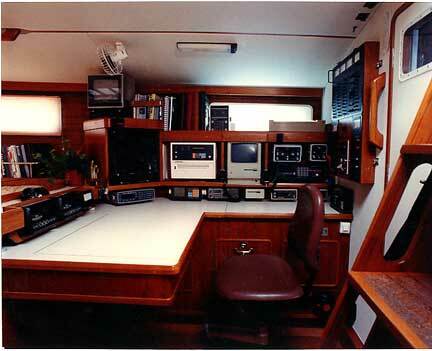 We’ve often had clients ask us about turning one of their guest cabins into a separate office. This one is set up as a video editing studio. It was later converted back to a sleeping accommodation. This is amongst the coolest of the head/shower compartments we’ve done. 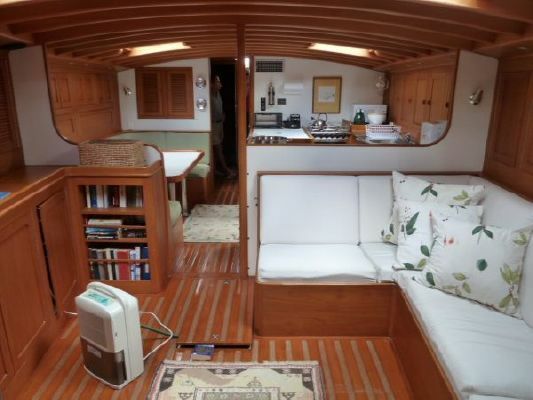 The pilot house is compact, which makes it very comfortable at sea. Seats are raised for good view lines forward. 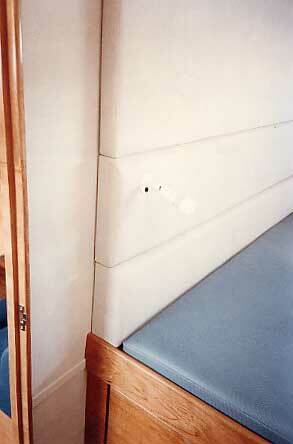 We’ve used this hinged foot rest detail on a lot of our designs. When you don’t need it, fold it down and out of the way. Maya was originally painted a light gray color. She was recently redone with a dark blue. Reaching in the trades. This is what the cruising life is all about! 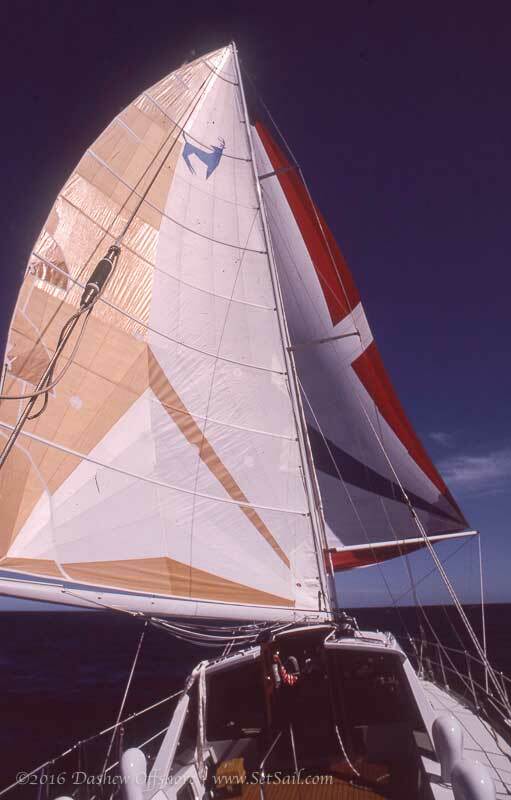 This design was a development of what we’d learned with our own Intermezzo II. 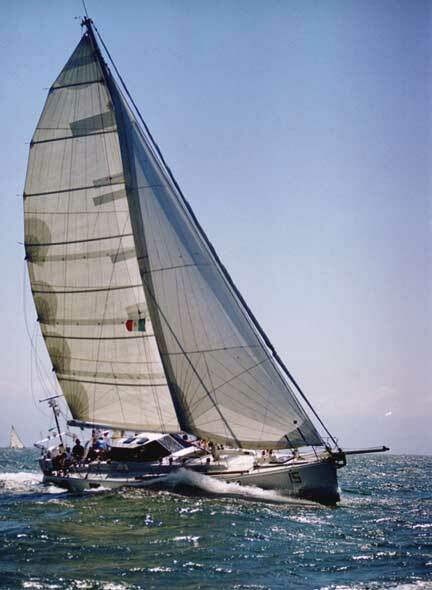 The hull shape was refined – it was significantly faster upwind and down – and the 2-62 has better powering capability. 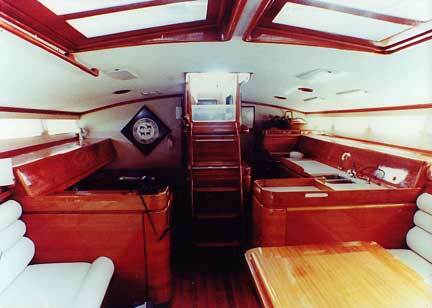 Coming on the heels of the Deerfoot 72s, we moved the engine room back to the center of the boat. 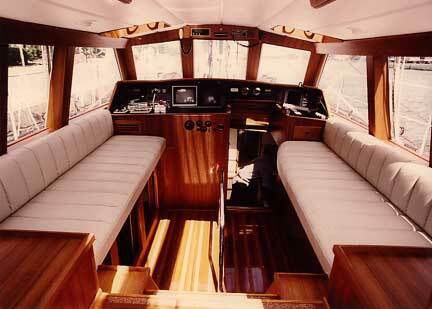 The layout of the interior then followed the same approach as the larger sisters, but in a more compact area. 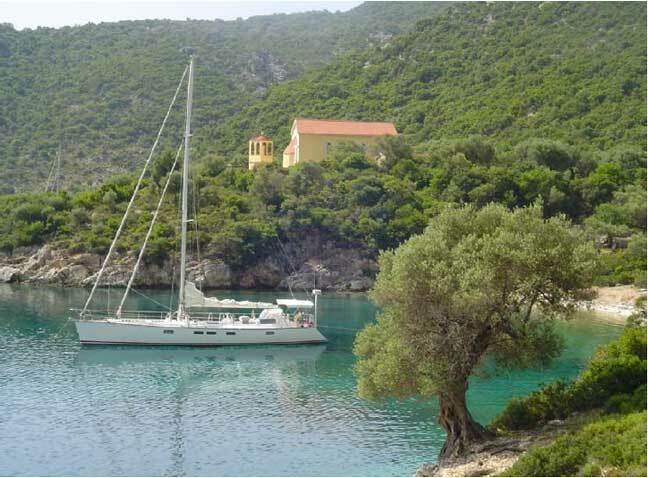 Most of our boats have the hull sides done in light colors. 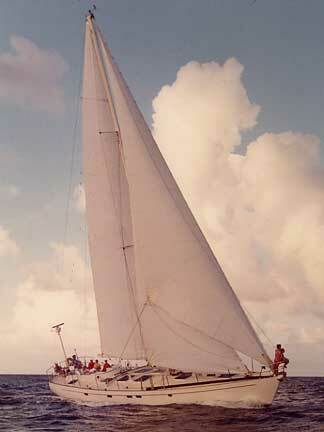 However, this particular boat had teak on the hull sides. This adds warmth, but also closes in the space visually with the dark color. We thought you’d like to see the comparison. 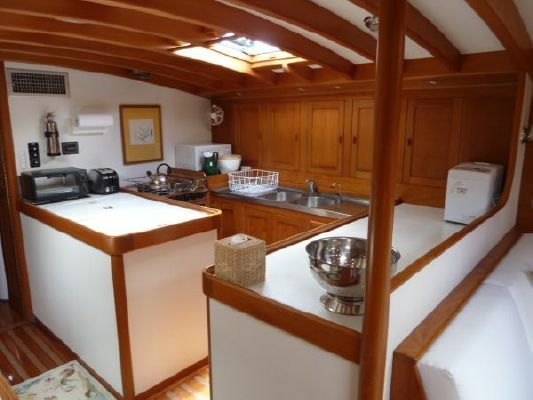 We’ve got enough beam and small enough engine room to allow a sink counter opposite the stove counters. 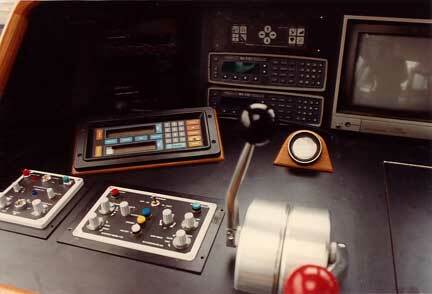 Ship’s office is adjacent to the engine room forward bulkhead. 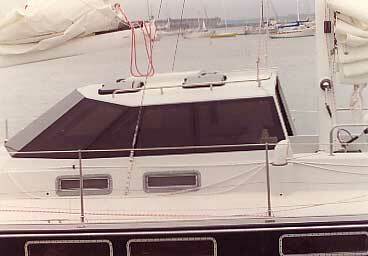 The head is en suite, at the forward end of the area, and adjacent to the forward watertight bulkhead. 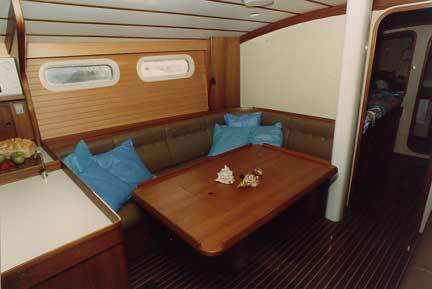 Looking aft towards the saloon. 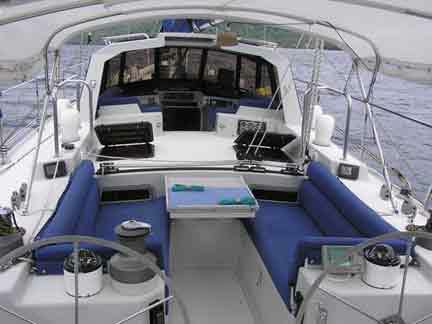 Guest cabins are aft. 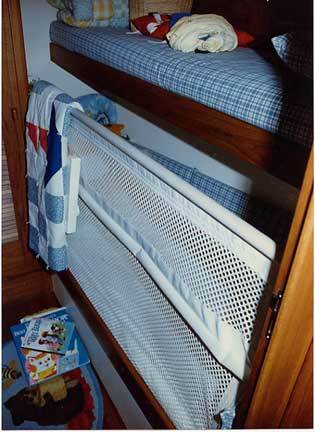 The upper bunk is typically used for storage. 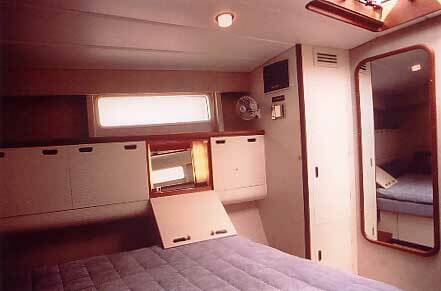 With this sort of arrangement, it’s important not to overhang the lower bunk too far, or a feeling of claustrophobia may set in. 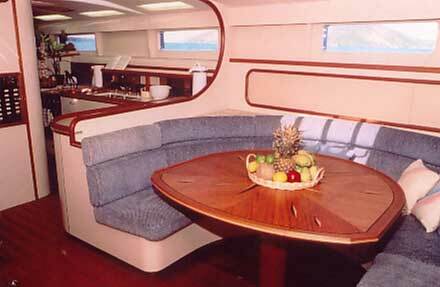 Over the years we’ve had a number of clients who wanted a circular saloon seating area, with “chairs” opposite. This looks really cool. However, there’s a trade-off. 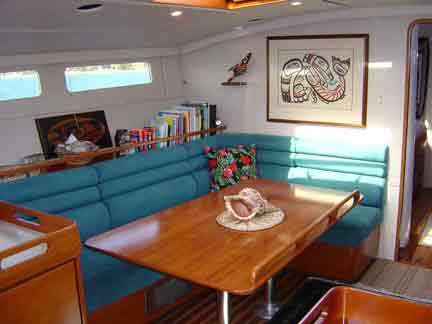 Compared to a saloon with straight (or gently curved) settees on both sides, this approach leaves nowhere for someone to stretch out in the saloon. But it does have a nice feel. 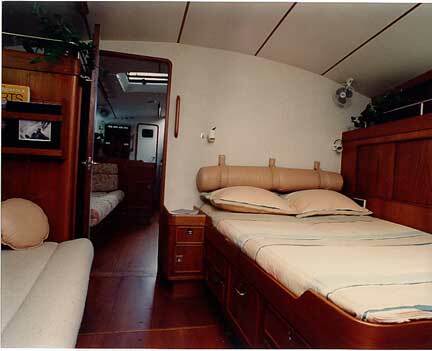 This is a sistership, identical in layout in the saloon galley area. The difference comes in the fabrics chosen. The saloon table features a series of inlays. 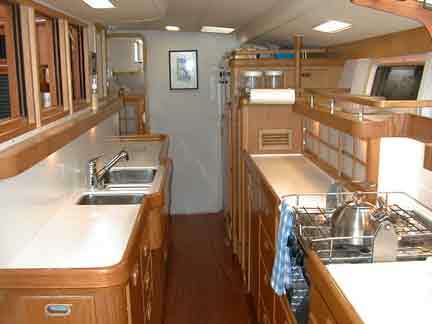 The galley is down the port side. This was a holiday meal, in preparation in the Virgin Islands when we took these photos. Couple of interesting details here. First is the inlay of two different colors of wood into the teak fiddles. You have to be careful with this design not to overdo things. Just a touch can look very cool. Too much looks very busy. 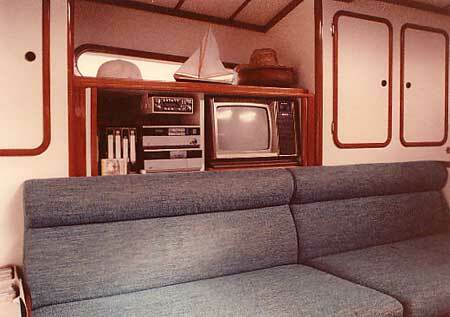 Note the saloon light controls on the small shelf behind the cushions. 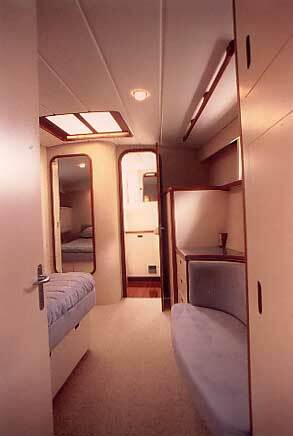 We work hard to make the sleeping cabin spaces integrate with the rest of the boat. This way, when their doors are open, they add a feeling of spaciousness. Having the doors as large as possible is a part of this design equation. This is looking forward into the Owners’ cabin. 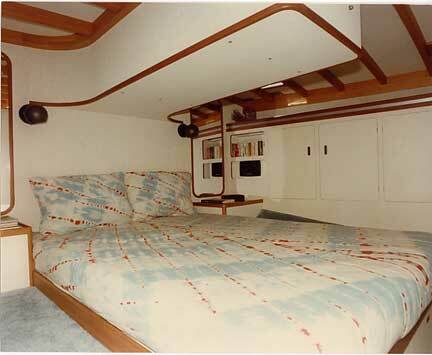 We’ve often been called upon to execute special bunk covers. 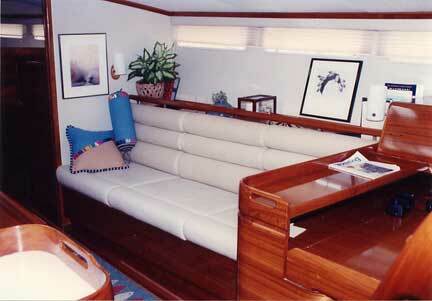 A small investment in a custom fabric design can yield a big payoff in appearance. This is the Owner’s suite forward. The head is through the closed door. 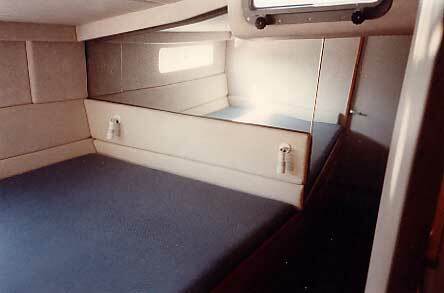 This bunk has space to walk around it on the outboard side. Sistership with a different look to the bunk cover. A small make-up locker with mirror and light to reflect back on your face. 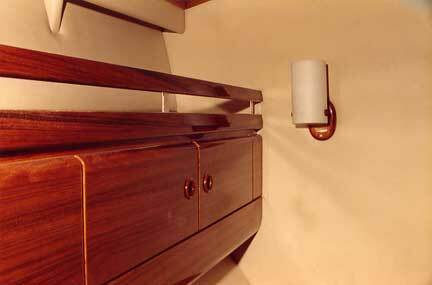 The idea behind this was to have an alternate location on which to work if the head vanity was in use. 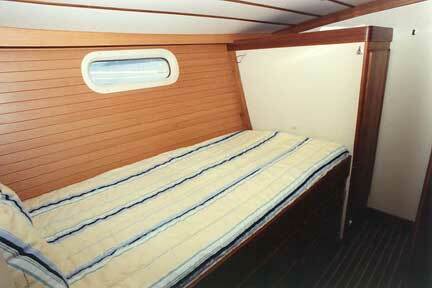 You will find on almost all of our larger designs a seat opposite the bunk. In theory these seats are used for reading, and sitting on when putting on one’s shoes. 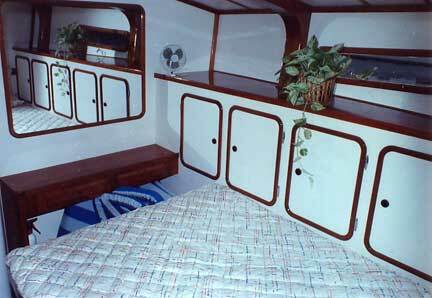 The reality is they look good, open the space visually, and provide a convenient location for the bed cover. Heads are almost impossible to photograph because of the tight space. However, we thought we’d throw this shot in to try and give you a sense of how these feel. 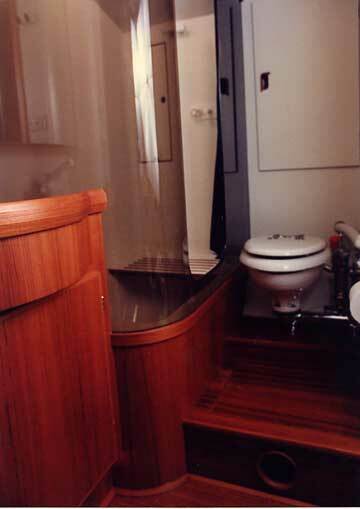 This is looking from the shower/toilet compartment across the boat to starboard. There were two of these boats built. 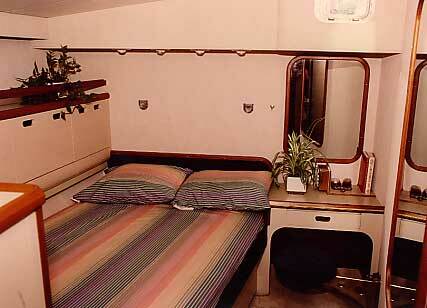 The interiors were identical except for the aft staterooms. 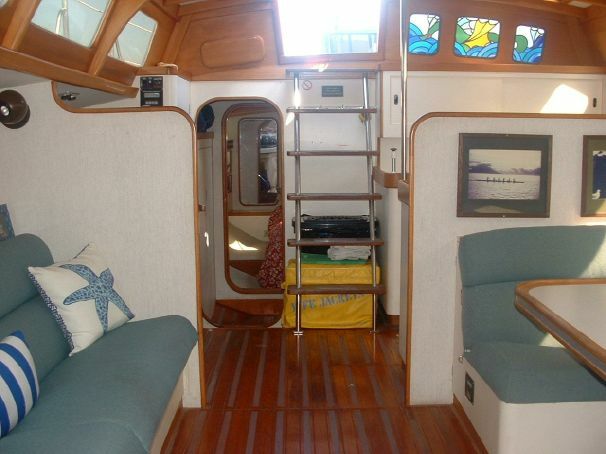 This boat has a large guest cabin, and a smaller crew/grandkids’ cabin with two bunks opposite. 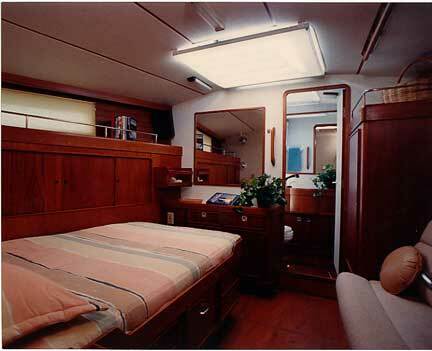 The sistership has two equal cabins. 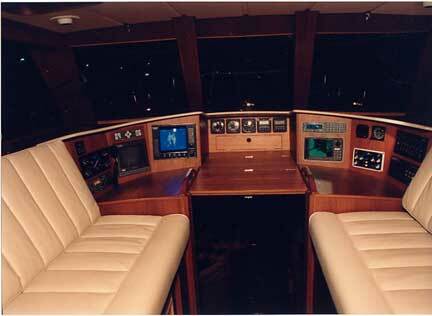 This pilot house has built-in electronics. This looks cool. But then you are locked in to using a carpenter whenever you want to change something. 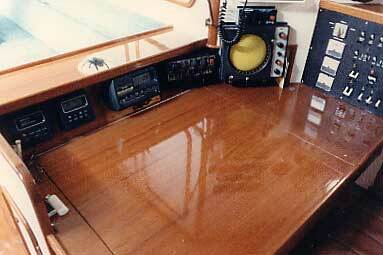 If you look carefully you will see a slot cut into the starboard side of the desk. 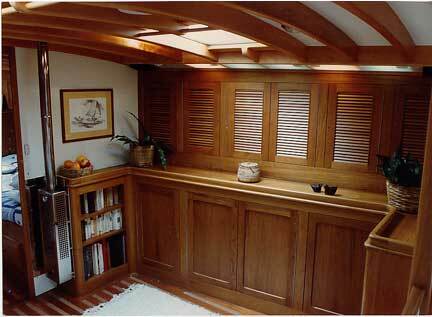 That’s for a tambour-style sliding door, to seal off the pilot house from light emanating from the saloon. Back to galley details. 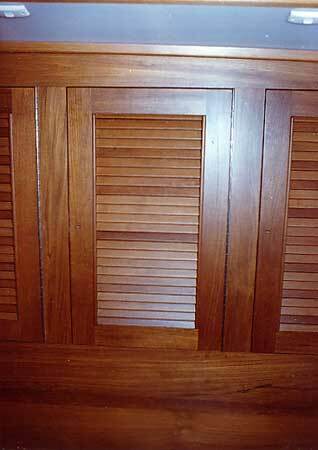 We’ve done a lot of these flush-faced drawer and door systems. The finish is high pressure melamine. It stands up very well, but is somewhat heavier (even though this is all cored) than timber-faced furniture. 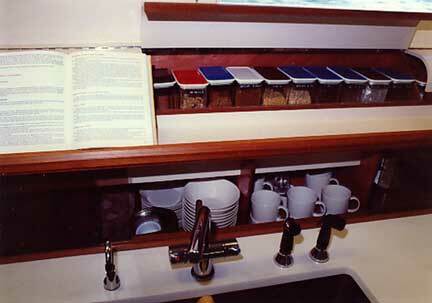 Galley storage always tops the list of where we spend a lot of design time. 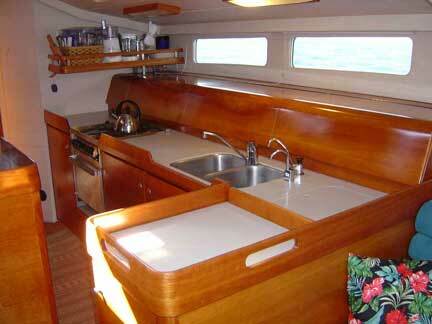 These boats had a double-decker arrangement, with dishes, cups, etc. down low, and bulk storage canisters above. A last interesting detail. 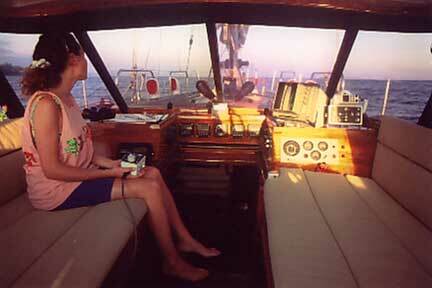 With a long bridge deck between the aft end of the house and the cockpit, some form of a brace is required. This cockpit table has been integrated with the brace. That way we achieve two objectives at once. 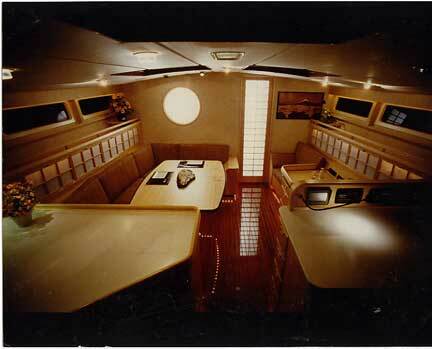 Intermezzo II’s interior look was similar in concept to Wakaroa, except that it was compacted into a 10-foot shorter (62-foot) hull. 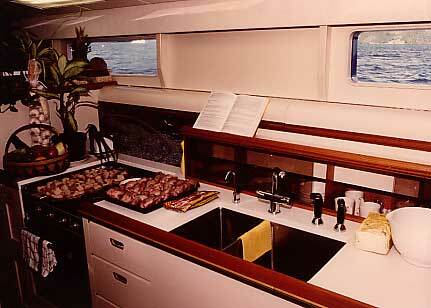 Above is the nerve center of the boat, the galley. 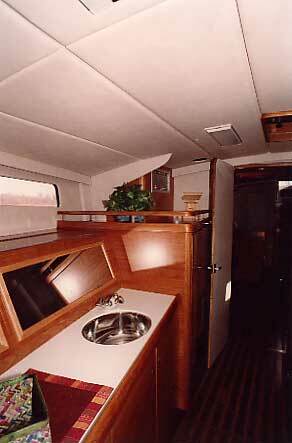 Note the fixed stove on the aft bulkhead. 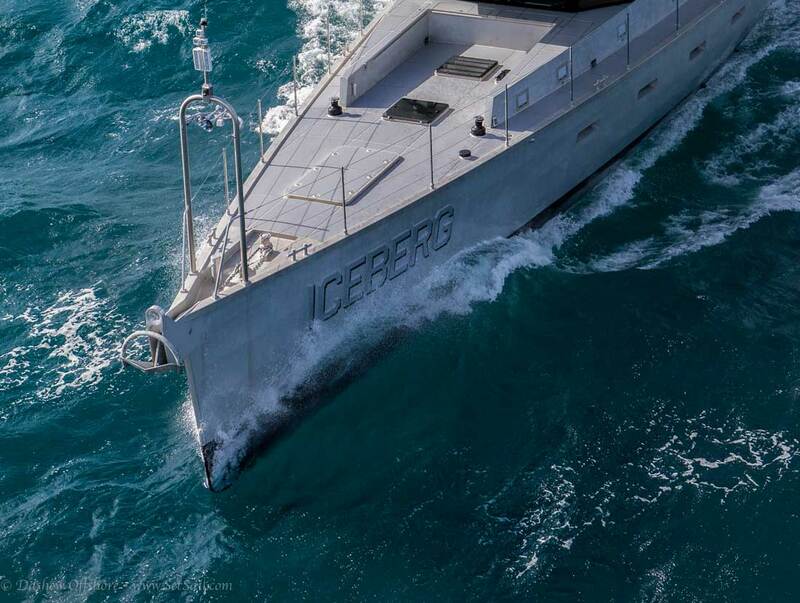 Except for baking at sea when heeled, this worked out well and kept the cook out of the line of fire should anything come flying off the stove. 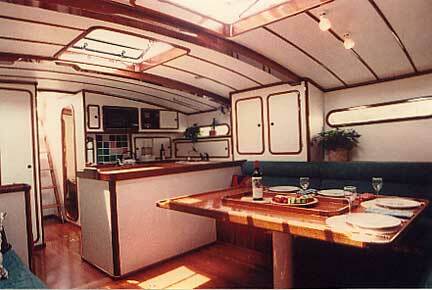 The saloon, looking aft towards the galley presented a very pleasing view. 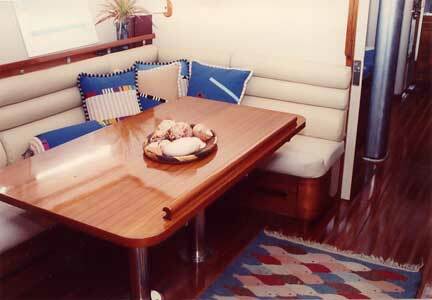 The saloon table – which seats five on the settees and another three on the folding chairs. The fiddles in the middle worked well for keeping condiments and serving dishes in place. Settee opposite the table and a modest entertainment center. 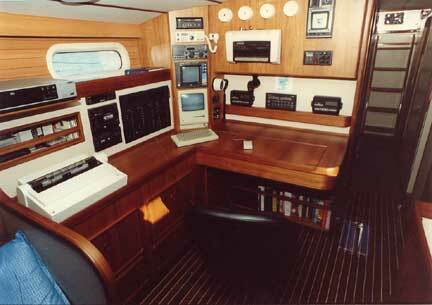 Ship’s office is to starboard, opposite the galley. We used this desk with a manual typewriter to write the first of our books. Later on we acquired an early computer with which we did our second book. 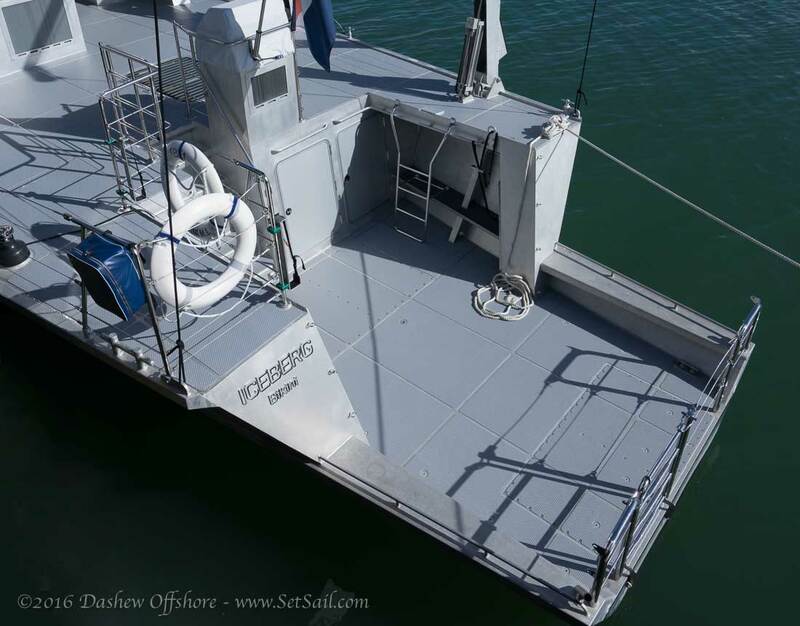 We use double pole breakers on our aluminum boats, which require a fair amount of room. Note the mirror at the foot of the bed. Using mirrors on bulkheads really opens up the visual space. 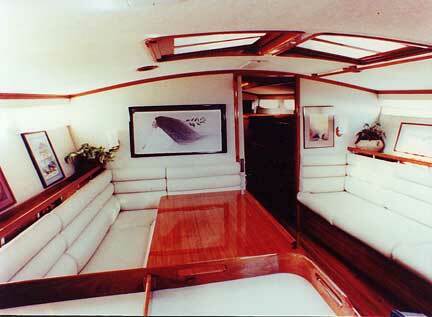 The large hull window is also nice for light and a sense of spaciousness. 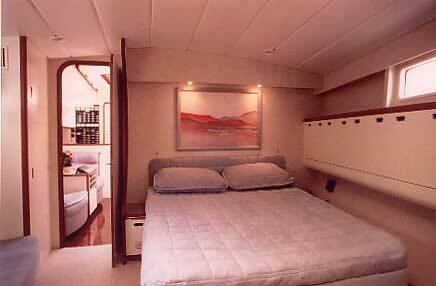 There are a pair of double cabins aft. 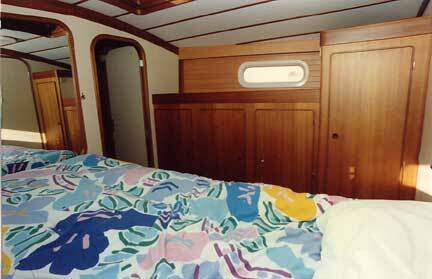 The lower bunks are “cozy” size for two adults (who are in love). 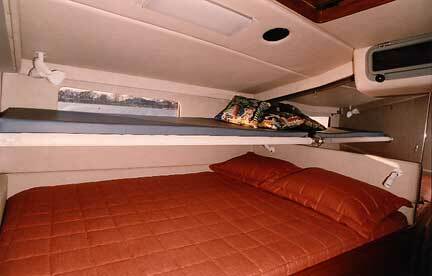 The upper bunks work well for storage, and the odd guest. 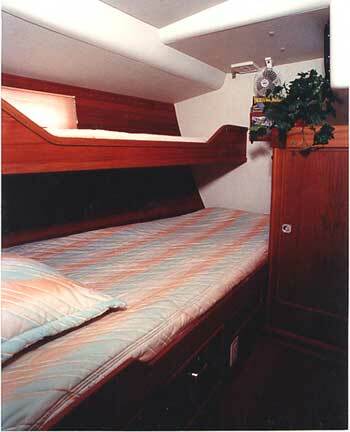 Note the overhang, or lack thereof between upper and lower bunks. 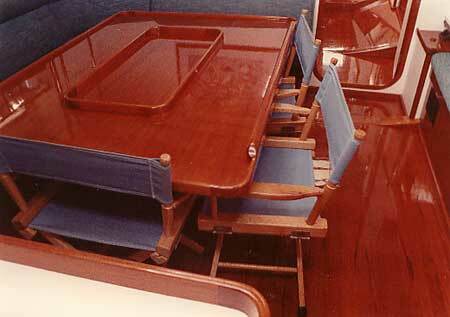 A different type of teak was used on these 62s. 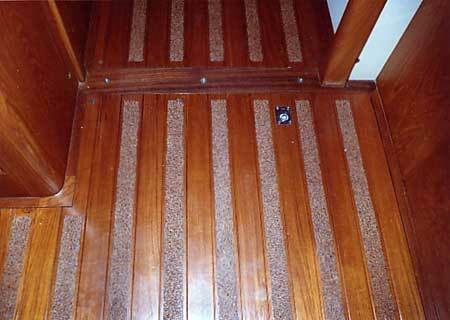 This teak is from Thailand. This is the first of our Deerfoot line. 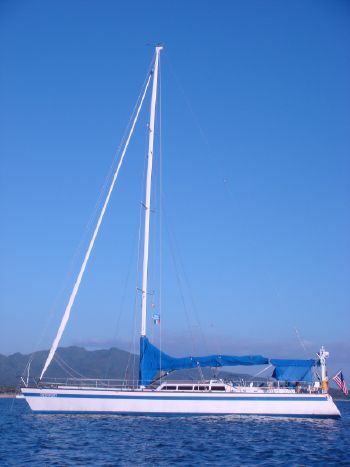 She’s 68′ LOA with a 14.5′ beam. That lovely light-colored timber is New Zealand Kauri. 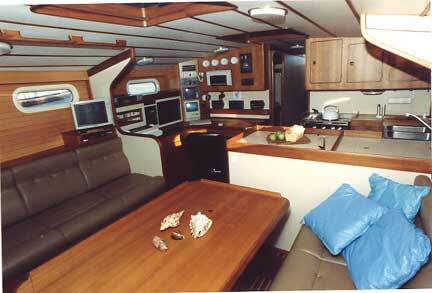 Deerfoot has her Owner’s suite aft – the only one of our yachts to have this layout. 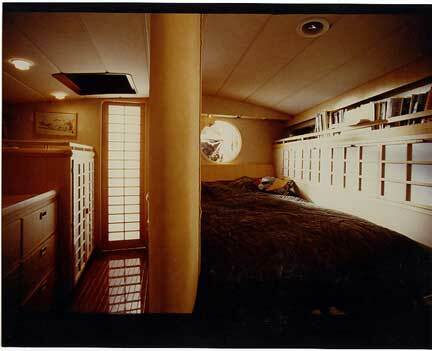 The combination of timber and light surfaces was pretty radical in 1978 – but commonplace these days. 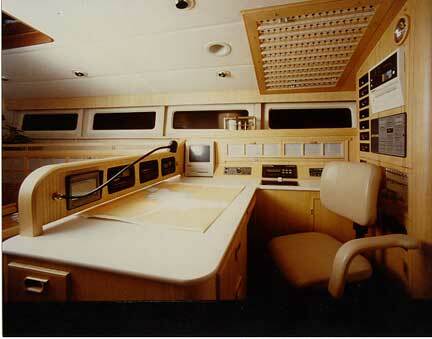 The nav station, with its suite of electronics and large work station. 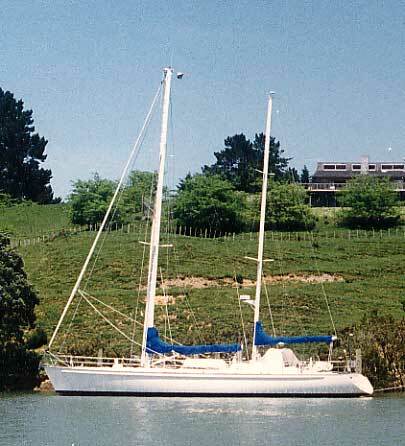 The 72-foot Wakaroa (same beam as Deerfoot) came next. This is the entertainment center opposite the saloon seating area. 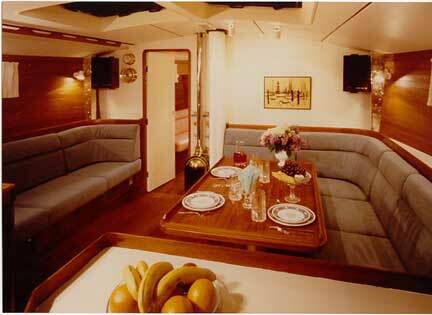 The saloon and galley form one large room, 20 feet long. This approach works well at sea and in port, creating a really pleasant sense of visual space (although it is tough to photograph). 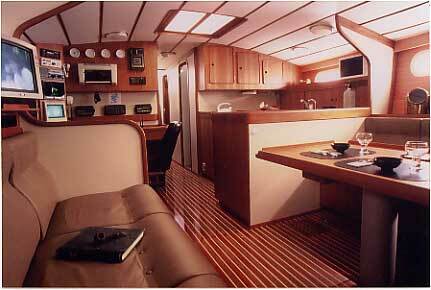 The heart of any serious cruising vessel – the galley. Huge fridge and freezer volumes and lots of easily accessed storage. 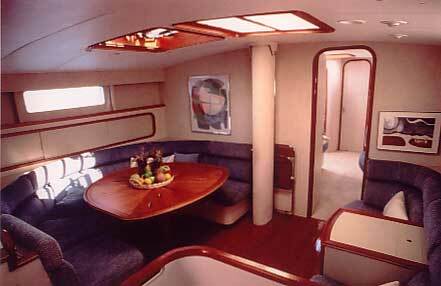 This is the first time we designed the Owner’s suite forward. It worked so well that all subsequent boats have been done this way. 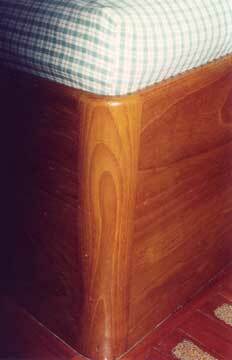 A chest of drawers at the foot of the bunk. 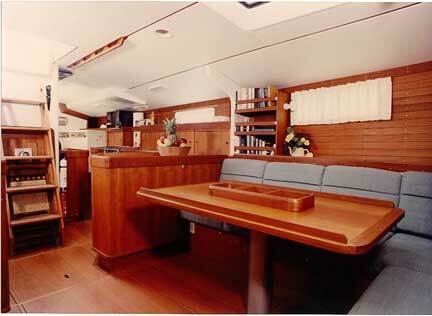 Note the quality of the teak timber! 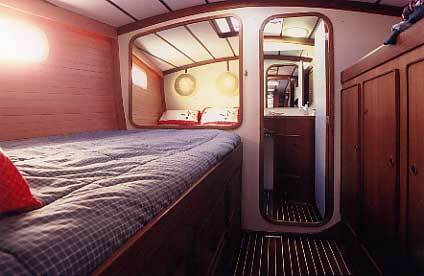 Opposite the bunk are a pair of hanging lockers and a seat optimized for a comfortable read. 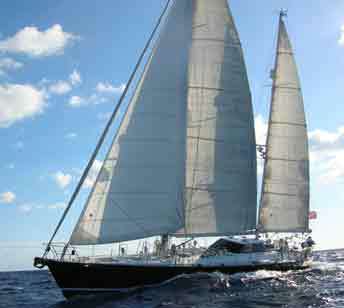 The Owners raised their two boys aboard. These little guys are now each 6’6″ (2m). The netting, with double bars, acted to keep the babies in place at sea. 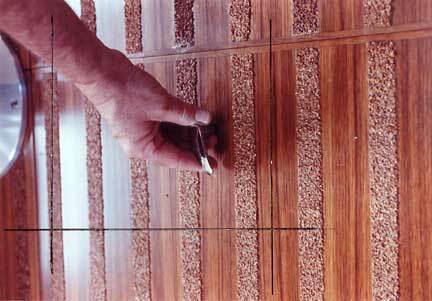 If you want to know what the work of the best carpenters in the world looks like, check out these photos. 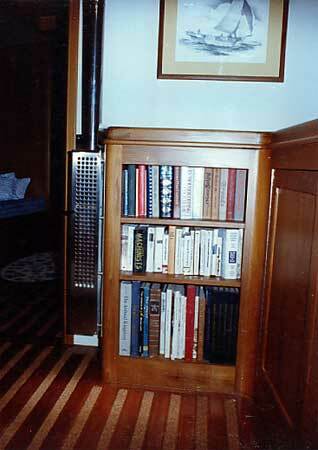 Book cases are better designed facing fore-and-aft where practical – this keeps the books in place offshore when heeled. 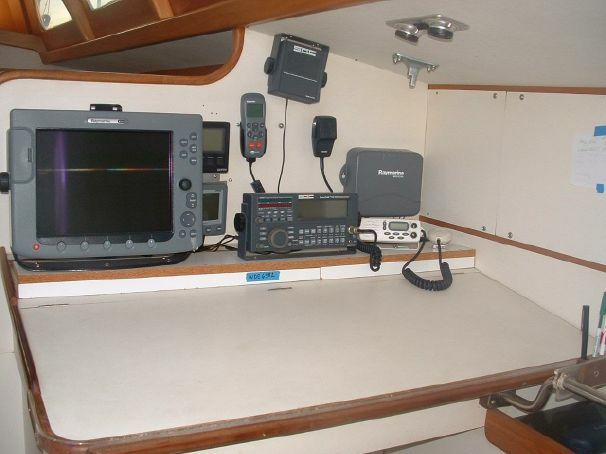 Our preference in nav stations is to design them so it is easy to change gear as time goes on. 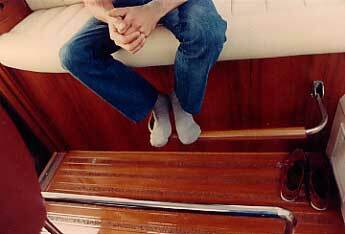 We’ve used this same approach to nonskid on our teak soles since the mid-1970s. It was tough to find timber that looks like this in the olden days. Now it is almost impossible. Freezer detail. 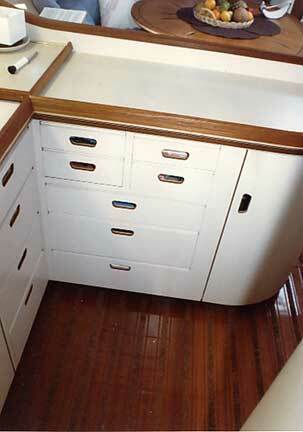 The insulated lid sits below a hinged section of counter. Both lid and hinged section have gaskets.